Seems like every time we log into Facebook, someone (nearly everyone) is playing a game. And wants you to play, too. FarmVille. CityVille. Mafia Wars. Not only are people having lots of fun farming, companies are making big bucks. Really big bucks. Zynga, the biggest of the social gaming companies, is currently valued at over $5 billion. That's a lot of strawberries and cattle. I recently attended the Digital Hollywood Conference in NYC. In a seminar on Social Gaming & Virtual Goods, I learned that more people play FarmVille than watch American Idol. There are between 100,000 and 200,000 new social gamers every week. 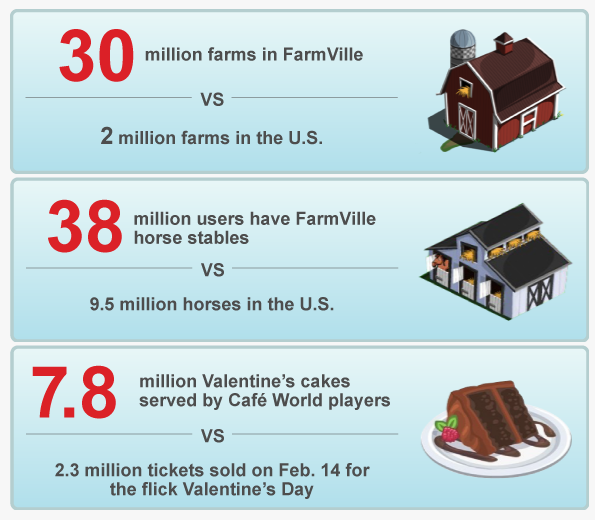 FarmVille alone has over 57 million users. Currently, 85% of all social gaming is done on Facebook--itself valued at $50 billion. Turns out there's a lot of money being made while we're all wasting time. Consumers are not only spending time playing these games, they're also spending money. Users spend plenty of real world cash on virtual goods. Additionally, users can earn virtual dollars by watching in-game movie trailers or commercials for products. Virtual Currency is a $720 million dollar business and could account for up to 20% of all gaming revenue this year. One topic on the horizon is any future regulation of virtual currency. How much is one actual dollar worth in virtual dollars? This regulation already exists in China and South Korea with virtual dollars being taxed and in the case of South Korea, eligible to be exchanged for actual currency. With billions of dollars at stake, the U.S. can't be far behind. Interested to see what game is on top this week? Check out AppData. Looks like CityVille is the leader today with over 20 million users.